Mississippi personal injury laws vary from other state’s laws. Below are the most common personal injury laws in the state of Mississippi. Understanding your compensation rights and getting the help of an attorney is your first step towards filing a successful Mississippi personal injury claim. The Mississippi statute of limitations for filing personal injury claims for negligence is 3 years, for personal injury due to misconduct, 1 year. Medical malpractice cases must be filed within 2 years from the date of the action which cause the injury or from the date of discovery. All medical malpractice cases must be initiated within 7 years from the date of the action. Product liability claims in Mississippi must be filed within 3 years. These statutes for Mississippi claims are subject to change, contact a Mississippi injury attorney for definitive statutes at the time of your accident or injury. 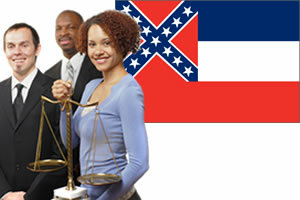 Mississippi has adopted a fault-based or "tort liability" system. Compensation is paid by the insurance company of the driver who is determined at fault for the accident. Additionally, if you have been injured in a car accident which was the result of another driver’s actions you may have the right to file a car accident case for uncompensated economic damages such as lost wages and medical expenses and for non-economic damages including pain and suffering. Mississippi uses the pure comparative fault rule to assess damages. Under this compensation rule an individual can receive compensation even if they are 99% at fault for the accident but their damages are reduced by their degree of fault. Are there Damage Caps in Mississippi Injury Law? For medical liability cases filed against a health care provider there is a $500,000 cap per plaintiff. H.B. 13 (special session); Amended Miss. Code Ann. § 11-1-60 limits noneconomic damages in civil cases to $1 million (exception for medical malpractice cases). Workers compensation wage loss benefits are equal to as much as two-thirds of the workers' average weekly wage, subject a maximum weekly amount and to certain time limits which are set by the Legislature.